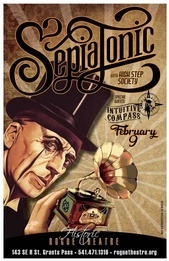 Sepiatonic is a vaudeville-inspired dance and music experience. Some parts theatrical show, some parts wild dance party, this project always brings innovative audio and visual entertainment! They feature non-stop original live and electronic music, focusing on electro-swing, but extending out into further realms of balkan beats, hip-hop, funk, and more.